We’re finally starting to wrap our minds around the damage to our city as best we can, and we continue to have our minds blown at the progress that’s being made on the clean-up each day. We’ve got quite the mess on our hands and we’re dealing with it, because that’s what we do. We’ve been getting a ton of questions from you guys by email and Twitter, so we wanted to give you an update on, well, everything we could find. For the more official information, check TEMA’s latest update as well as this morning’s press release from Metro. Bridgestone Arena: There was extensive damage to the floor, carpeting and walls on the event level. Officials started assessing for any structural or other kind of damage on Wednesday, and although there’s no timetable for assessment, they expect to be all prettied up in time for James Taylor and Carole King on May 22nd. Country Music Hall of Fame: The Hall of Fame was able to open back up today despite some significant flooding in the mechanical room (and by “significant,” we mean 5 1/2 feet of water!) and some water damage to the Ford Theater. None of the exhibits were damaged and repairs and restoration have already begun on the theater. Gaylord Opryland Hotel: We’re pretty sure that everyone saw the footage from inside Music City’s most well-known hotel, and it was pretty disturbing. And yeah, it really was that bad. The best estimate we’ve been able to dig up is that it should be back open “before the end of the year,” and they’re not accepting any reservations through October. Gaylord’s employees will continue to get paid for at least the next six weeks, but lots of folks are out of work. The Opryland Hotel also brings in 25% of Davidson County’s hotel tax revenue, so the economic impact could be huge. Then there was the whole issue of classified Defense Department documents going missing in the floodwaters. Grand Ole Opry House: This is another disturbing photo that made its way around the internet. At the peak of the flood, two feet of water covered the actual Opryland stage. Officials say they some of the more important stuff (Opry costumes and parts of the set, maybe?) to higher ground and saved them. The stage will need to be completely replaced, but that famous circle of wood cutout from the original Ryman stage is in “surprisingly good shape” and will likely be salvaged. Until the Opry House gets back on its feet, it’ll be making the rounds to a few different interim venues. LP Field: We all saw LP Field pretty much transform into a swimming pool earlier this week, but thankfully the damage seems to be minimal. Some water leaked into the locker rooms and the working level so the carpets are ruined, but it’s nothing that a little insurance coverage won’t fix. Even the practice bubble over in MetroCenter made it through unscathed. We can only hope this is a good omen for next season. Nashville Farmer’s Market: Again, the pictures of Rosa Parks Dr. near the Farmer’s Market were pretty daunting. However, the farm sheds and flea market are both open for business today. If you plan on heading out there to support them (and you should! ), check their website first for some small parking and procedural changes. The inside part won’t be opening for at least another week. Opry Mills: We haven’t been able to dig up much information on the mall itself, but by the looks of the video footage and the fact that it’s right next to the Gaylord Opryland Hotel, we can’t imagine it’s doing too well. We just know that there aren’t any piranhas swimming around, despite an earlier report from WKRN. Much like the hotel, we expect that any sort of long-term mall closure could have some pretty big economic repercussions on many levels. Ryman Auditorium: Totally didn’t flood at all. In fact, they already hosted the Grand Ole Opry show this past weekend while the Opry House mopped up and they’ll be hosting a few more in the coming months. Schermerhorn Symphony Center. It was a close call, but the floodwater missed the actual concert hall and stage by 8-12 inches. Unfortunately the basement level filled up with water almost entirely, and their fancy (and gorgeous) $2.5 million organ took a major hit with both the console and operating mechanism suffering extensive damage. They also lost two beautiful Steinway grand pianos and their entire kitchen, which were also in the basement. They don’t expect to open for 4-6 weeks and will probably take the show on the road around Nashville, much like the Opry will. Folks who have tickets for shows in the next few weeks are welcome to request a refund. Two counties are still under mandatory water orders: Davidson and Williamson (that includes you, Franklin and Brentwood). Until further notice, we’re supposed to be cutting back on our water usage by not using it for much else besides drinking. As of Friday morning, our reserves were back up to 56% from the rock-bottom 37% earlier this week In Davidson, our second treatment facility is still down for the count and officials have no idea when it’ll be fixed. So! If you see grass-watering or car-washing (and you know for sure that they’re not using repurposed floodwater,) call 615-862-4600 to report it to Metro. 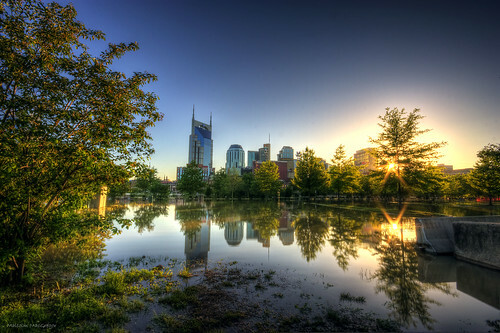 The Tennessean has put together a great collection of resources on water conservation. Metro is handing out the non-drinkable water for cleaning, watering yards, and other stuff that doesn’t require it to be potable. More information about that here. Our drinking water is still completely safe. Don’t believe what you hear. According to Mayor Dean, the damage assessment (so far) is at $1.5 billion, some of which will not be covered by FEMA. People in these counties are eligible to apply for FEMA assistance by visiting DisasterAssistance.gov or by calling 1-800-621-3362 (1-800-462-7585 for the hearing and speech impaired). All major interstates and highways are open. TDOT has inspected all the major bridges and everything is fine. They’re more concerned about the bridges on rural county roads. Nashville MTA buses are running on a limited Sunday/Holiday schedule. Information for this weekend’s routes can be found here and those planning to ride on Monday should check out next week’s update. Until the buses are back on a normal schedule, most fares will be free. The Music City Star commuter train will start running a limited route on Monday. Oh and according to TEMA, we all get to drive in the HOV lanes of metropolitan areas for the next 30 days no matter how many folks (or how few, really) we have in the car. That’s exciting, right? There are still 16 Red Cross shelters open. But the number of folks using them has dropped from 1,300 to 406, so that’s great news. Check the Red Cross website for up-to-date information about what they’re doing around town besides running shelters. The number of folks without power has dropped from 150,000 to 3,300. Party!